From the Hancock County Courthouse, go southwest on Hwy 22 for 7.2 miles to the intersection of Hwy 22 and Main Street in Devereux. Turn right (at the backward fork) onto Main Street and go 0.2 mile to Church Street on the left. Turn left and follow Church Street for 0.3 mile until it merges into Devereux Rd. Go left on Devereux / Jones Chapel Road and follow it for 0.8 mile to the cemetery on the right. 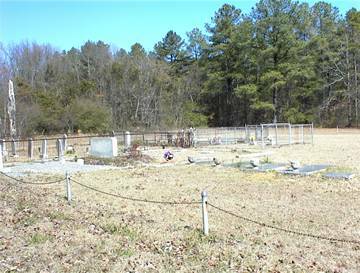 The cemetery is at the corner of Devereux and Warren Chapel Roads. Middle name per Jewel Thompson. Stone reads 'A.' only. On same stone as Leila Jones Amoss. On same stone as Albert H. Amoss. Interred St. Paul Church, Putnam County. Thompson. No military info on grave. "Dedicated by his wife, Bettie Bass"
Lieutenant. Co. I, 59th Ga.
w/o F. A. Butts. "She was a kind and affectionate wife and mother and a friend to all." Infant s/o S. P. and Florence Norman. "There is a beautiful region above the skies and I long to reach its shore, for I know I shall find my treasure there, the loved one gone before." Corp., Co. I. 59 Ga. Inf.